Mrs. Winner's Chicken & Biscuits quick-service restaurants serve traditional southern fried chicken and home-style menu items in a warm, friendly atmosphere throughout the Southeastern United States. It's always the right time for Mrs. Winner's! Here at Mrs. Winner's Chicken & Biscuits, we're so much more than just the most delicious, southern-style restaurant in town. We're a FAMILY of chicken and biscuit lovers! So gather up your family, call your friends, and come on over to your local Mrs. Winner's dining room. Our classically American southern-fried chicken, hot buttery biscuits, and home-style sides can't be beat, and we have a seat at the table just for you. There is no better business value out there today than Mrs. Winner's, and we’re going to tell you why. If you’re serious about achieving an independent lifestyle based on quality, courtesy, teamwork, and great food, this is what you have been looking for! Click here to learn about our amazing franchise opportunities and why you should join our growing family. Having a big get-together with your family, work, or church? Give us a call, and we will partner with you to arrange the perfect catering plan. 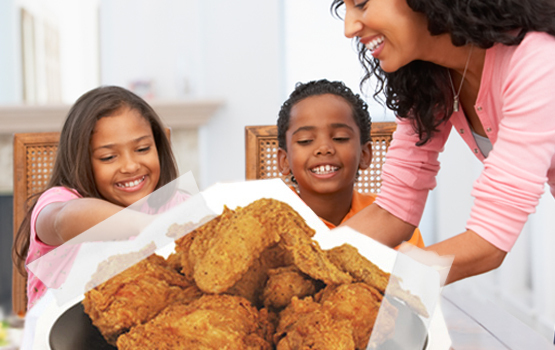 After all, nothing says family like getting everyone together to enjoy a great meal. At work? In the car? At home? It doesn't matter where you are. Wherever you are, it's always the right time for Mrs. Winner's! It's time for you to join the friendliest family in the food industry. Mrs. Winner's is growing, and you can be a part of our success. See how you can bring a Southern-good business to your home town. Opportunities are available for multi-unit franchise territories through the Southeast. There has never been a better time to invest in this well-known legacy brand and reap the benefits of getting in early. Everyone is talking about Mrs. Winner's! Click here to see what all the fuss is about, and why USA Today calls out our fried chicken as "crunchy and delicious" and says our "authentic Southern touches and flavors set this chain apart from its competitors." Mrs. Winner's is about traditional Southern food, family, and values. We love our customers, and they love us right back! Making great food is our passion, and spending time with great people is our joy. Mrs. Winner's is home.